be held at a later date. It is with very deep sadness that we announce the passing of our beloved Mother Elizabeth (Betty) Hardy. 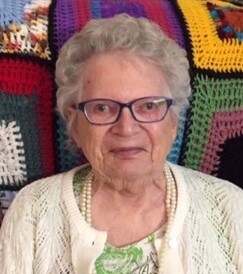 Mom passed away peacefully at Evergreen Place, where she resided, on January 26, 2019 at the age of 92. Left to treasure all of the wonderful memories that were made are her children: Janet (Ed) Giesbrecht, Evelyn Foreman, Ernie Facey, Vivian (Garry) Couckuyt, Brenda (Allan) Halliday, Ed (Dana) Facey, Melanie (Ron) Henderson, Brian (Val) Facey, Carrol (Dean) Ashley, Don Hardy, as well as many grandchildren and great grandchildren. Mom was predeceased by her husband Les Facey in 1967; her late husband, Lloyd Hardy in 1998; daughter Sharon and grandson "Little Ray" in 1995, and her son Howard in 1966. She raised all of her children on a farm north of Boissevain, until the passing of her husband Les in 1967. She had a great love for and spent most of her time with her children. As well, she loved to play bingo, play guitar and sing, and sang in the church choir in Rugby, N.D. She also loved baking and gardening. She had many friends in Boissevain and Rugby and always brought a smile to those who knew her. For those who desire, and in memory of Mom (Betty), donations may be made to Boissevain Health Centre-Palliative Care or Evergreen Place.